The tale begins with Batman on the Joker’s trail. He’s immediate caught in an explosion that sends him back to the Batcave, wounded and needing Alfred’s care. Meanwhile, a chance encounter with children sends the Joker into a jealous rage when he sees he’s being depicted a loser, always defeated by Batman, in comic books. 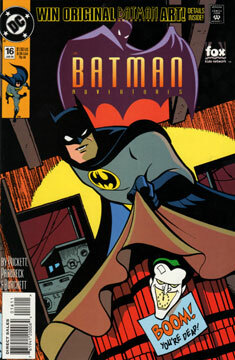 He tracks down the artist and kidnaps him, forcing young Anthony Baldwin to draw the Joker’s exploits as they happen. Anthony then sends the art to his publishers, who continue to print. While Batman recovers, Joker attacks the cryptographers’ convention, arranging for a coded message to be sent to Batman as to where and when to meet. Batman takes the bait and heads for the miniature golf park Joker has specified. Once there, Batman is subdued and fitted to a mini-golf/rocket death trap. Naturally, this can only be triggered by a hole-in-one, which the Joker can’t seem to manage. By the time Joker gives up putting, Batman escapes, and manages to subdue the Joker with Anthony’s help. Fantastic. And the visual pacing could not be better. One of my favorite parts of this book is the cover. It’s actually the first panel of the story. That’s brilliant! I’ve never seen that done before or since. And I know many of the faces in this issue are friends and staff of the creative team. Nice touch. No. This tale could fit in just about anywhere. Oh yeah. Joker in a 1920s style fur coat! Joker as a chef! Joker in a crazy golf outfit! It’s great stuff. Batman seeks the help of… Poison Ivy?